Keith Courage in Alpha Zones was the original pack-in game for the TurboGrafx-16. 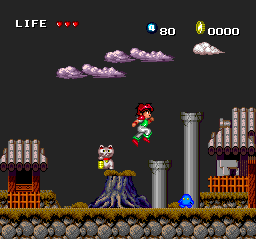 It’s an action platform game consisting of 7 themed levels, each with an overworld and underworld stage. In the overworld, you control the human Keith Courage, making your way through a village fighting off small enemies with a dagger and collecting gold which you can then use to buy bombs, upgrade your weapon, and pay a nurse to heal you. In the underworld stages Keith Courage wears the “Nova Suit”, which turns him into a powerful, sword-wielding monstrous cyborg. While Keith is stronger and faster in the underworld, the enemies are as well. Each underworld stage culminates in a boss battle, after which Keith returns to the overworld. Keith Courage isn’t a horrible game, but it’s quite forgettable and was arguably a poor choice for inclusion with the system. Although the game has 7 levels, they al look the same, but with different color schemes and a couple of new enemies. One could make the same argument about Super Mario Bros., but that game made it work through the use of interesting level design. In the overworld, the human Keith Courage moves slowly and stabs at his enemies with a little dagger while in the underworld his movement is so unwieldy that it the controls feel like they lack precision. The fact that the game play changes so much between stages is distracting and disruptive. One of my biggest gripes with the game is that you only have one life. This is made up for by the fact that your character can absorb a lot of hits before he dies, but the nova suit stages are littered with spikes that cause one-hit deaths. Every time you die, you are greeted with a “Game Over” screen, but it doesn’t matter because you have unlimited continues and can therefore beat the game on the first play-through. Most games require a cheat code for unlimited lives, but this game effectively gives them to you by default. My buddy Anthony tells me that I can’t appreciate this game because I didn’t own the TurboGrafx at launch, but I’m going to have to call shenanigans on that one. Had I bought the system at launch and played this game, I think I would have gone running back to the far superior platformers on the NES. Buy Keith Courage on GameGavel or Amazon. Tagged HuCard, Keith Courage, Keith Courage in Alpha Zones, launch, Mascot, PC Engine, Platformer, Review, turbografx, turbografx-16. Bookmark the permalink.